Gloria Eden, known as ‘Glory’, is a semi-literate, middle-aged woman living on the edge – a bag-lady. Her world is that of urban dereliction and social vermin – drop-outs, misfits, the homeless.Her redeeming feature is the abundant energy with which she confronts a seemingly hopeless situation, often turning what might appear to be suffering and misery into comedy. Then, unexpectedly, she comes to the rescue of a young boy who has run away from home, Darren, and soon they are both on the run from the powers-that-be. In her debut novel, Adrienne Silcock enters the mind of this enterprising anarchic survivor and gives her a voice forged from vernacular speech at its most vigorous. 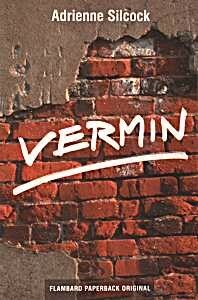 Although written in a more conventional idiom, the six short stories that complete the volume are thematically related to Vermin and continue Adrienne Silcock’s exploration of loners and social outsiders. A chance meeting on holiday followed by a second coincidence ensnares two couples into deceit, blackmail, lost love and a desperate search for identity. Shortlisted for the The Virginia Prize For Fiction 2009. Aphrodite finds it difficult to adjust when her beloved father dies, leaving her with her harsh, controlling mother. The increasing influence on the family of her abusive uncle Gerald adds to her psychological problems. Aphrodite struggles against the odds to win her sanity, gain her freedom and develop her artistic talents.